What does Dahongpao tea means to ordinary people like you and me? Two excellent AAA and AA graded teas from the Wuyi Mountain, with the latter being heavily roasted. Among all the Chinese oolong teas that exist, none is so hyped up as this King of Oolong. What's the story behind this legendary tea? How can we, as 21st century tea drinker, repair our connection with the him? The word Dahongpao means Big Red Robe. The original tea plant is found in the Nine Dragon Cave, where the Six Tea Bushes reside today. He is prized for its health-enhancing property. According to a legend, a scholar fell ill on-route to Beijing to take the Imperial Examination. A monk cured him using the tea leaves plucked from the Six Tea Bushes. When he returned later, having passed his the Examination with flying colors, he offered a Red Robe as a gesture of gratitude. Perched on a cliff, the Six Tea Bushes have lived for more than six hundreds years. It is said that during the Cultural Revolution, policy guards kept watch 24/7, to safeguard them from the marauding revolutionaries. 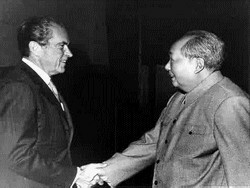 When President Nixon visited, Chairman Mao presented him with 100 grams of tea leaves. When Nixon alluded to Mao's "stinginess", Premier Zhou explained such tiny quantity is worth half of Chinese Empire. Today, the Six Tea Bushes produce less than 100 grams of leaves each year, all of which is retained by the State government. Only a precious little is seen or heard in the real world. The first medallist of the Beijing Olympic 2008 was awarded this tea. A 2002 State auction saw 20 grams sold for more than 30 thousands dollars to a restaurant in Guangzhou. Being the most famous tea of Wuyi Mountain has many drawbacks, attracting not only a price premium, but also cheap imitators. I have found Dahongpao to be the most difficult Wuyi tea to source. This AAA grade is the best high grade I have ever tasted. Grown in the Authentic Source, he is a second/third generation Dahongpao cultivated using the asexual method from the Six Tea Bushes. The first brew yields a dark amber that glows with a luster. Take a sniff, experience the unique fragrance radiating out. Take a sip, feel the smooth liquor passing through, with remarkably little or no astringency. Feel the pleasant bitter aftertaste, which soon turns sweet and silky. Observe the charcoal fire around your tongue, and the lingering fragrance of Osmanthus higher up. Imagine the feeling of yanyun - described in China as Crag Bone and Floral Fragrance. The blend peaks at around the fifth infusions, with later infusions being more floral and less charcoal. Test the limit of his endurance. It is said that at high concentration (5 grams of leaves in 100 milliliters of water) a Dahongpao tea go up to 9 infusions. When you are done, pour out and admire its wholesome leaves. Observe the colors and texture. The most popular Wuyi tea in China is the heavily roasted variety such as this AA grade and our Tieluohan AA grade. Also, like all other Wuyi teas sold in this tea shop, this is a Zhengyan, grown in the Middle of the Rock from the volcanic ash in the middle of the Wuyi Mountain. We relaunched this tea in 2017 due to popular request, as his mouth taste and fragrance are excellent, offering amazing value for money for the price point. The only thing it is lacking compared to the AAA grade is the fruity fragrance that is only present in a high grade. All of the teas that I have received from you are supurb. I am so happy to have found you & your company. My Chinese extended family agree with me. Freshness & taste are #1. If #5 is the highest then that is my rating. It is just the best. You are most welcome to publish my feedback. I enjoy your newsletter as I gain much knowledge from you. I especially enjoyed which tea for which season. Full body, warmth - which is already suggested by the depth of its colour both the leaves itself and when steeped in a white cup, a hint of natural "sweetness", pleasant "tail". "Bordeaux" of the teas (of the ones I have had so far anyway) and I am looking forward to going on to the next ones that were included in this order. Truth be told, I like the Dahongao so much that I have been neglecting the majority of my other tea's, all in good time, I have no doubts to the quality of your product as I have yet to try a single one I didnt like. I would rate the Dahongpao 5 out of 5 on my list, but that's just cause its my favorite. Unusual. With the exception of Pu Erh I largely drink unfermented or lightly fermented teas. I has assumed the Dahongpao was a green oolong and was surprised to find otherwise. The scent and intensity are quite unique within my experience and I am coming to enjoy it more with each tasting. Dahongpao AAA in the Wuyi 7-in-1 package was a nice surprise as I'm quite new to roasted oolong. It has some similarity to phoenix oolong, but has more layers (floral notes etc) in the taste. Because of my lack of comparison points I'll give 4/5. Can't wait to try the other samplers! For further information about packaging, brewing, maturation and storage, read Wuyi Tea - Further Guide.